We have been getting a lot done outside lately. Working outside involves a lot of carrying piles of dirt, weeds and plants from one place to the next. 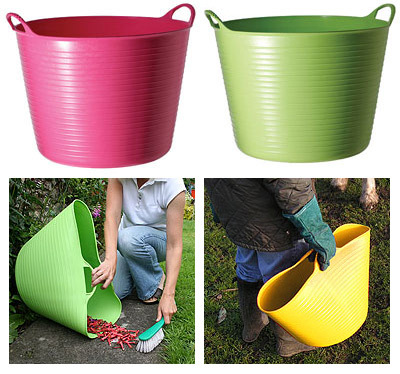 I am currently drooling over these Tubtrugs I saw on NotMartha and Da*xiang. Ha ha...to funny...I was just reading the same post and am on the hunt for one in Charlotte. My friend Kim has a couple and said they are awesome! I live in apt, without yard space (but with a small deck) and pretty much never tote things around, but I want one. That's how cool they look. How can I justify it? You've got to get one! I saw these @ notMartha too & immediately put a bunch on my Amazon list. I want them for toys, weeding, shoes... But I may be getting some sooner since I noticed they're carrying them @ this little plant place near Nico's school. I drive by it 4 times a day. Can't wait for payday! I remember seeing these on NotMartha, but then I saw them in the Gardener's Supply Company catalogue. I would like a couple, since right now I just throw weeds in the driveway. I think I am going to order a yellow one and a sky blue one today!